The MBA Games helped Brittany Bowlen choose to come to Fuqua. Bowlen taught figure skating to Special Olympics athletes in Colorado before coming to Duke. When researching MBA programs, she was looking for community involvement. MBA Games is a Fuqua student club that fundraises and advocates for Special Olympics North Carolina. The club launched in 1989 and has raised over $2.5 million since then, making it one of the organization’s largest and longest-running fundraisers. The effort is spread throughout the year, with familiar-sounding events: a wing-eating contest, a 5k run, an ugly sweater contest. A Fuqua twist comes with a silent and live auction each February. Local businesses donate items, while faculty and staff invest their time in auctioning off personal prizes, such as dinner or wine-tasting at their homes. Careers Counselor Mary Beck White-Sutton makes some of her famous pecan pies (“They’ve sold for more than $100, which is crazy,” she said) and a flier for the auction teases dinner with Fuqua “heartthrob” Professor Ryan McDevitt. At its root, however, the club is about student activism. Bowlen is one of three Daytime MBA students who led the 2018 efforts. Colleague Zach Smith said he knew he wanted an outlet that would help him “step back from the business school bubble” while at Fuqua, and contribute to something that would have an impact on Durham. The third member of the team is Matt Rappaport, whose youngest brother has autism. Rappaport said he’s been volunteering to support the special needs community in his native New Jersey for as long has he can remember. That spirit of inclusion is at the core of the MBA Games event itself, the climax of the club’s yearlong fundraising effort. 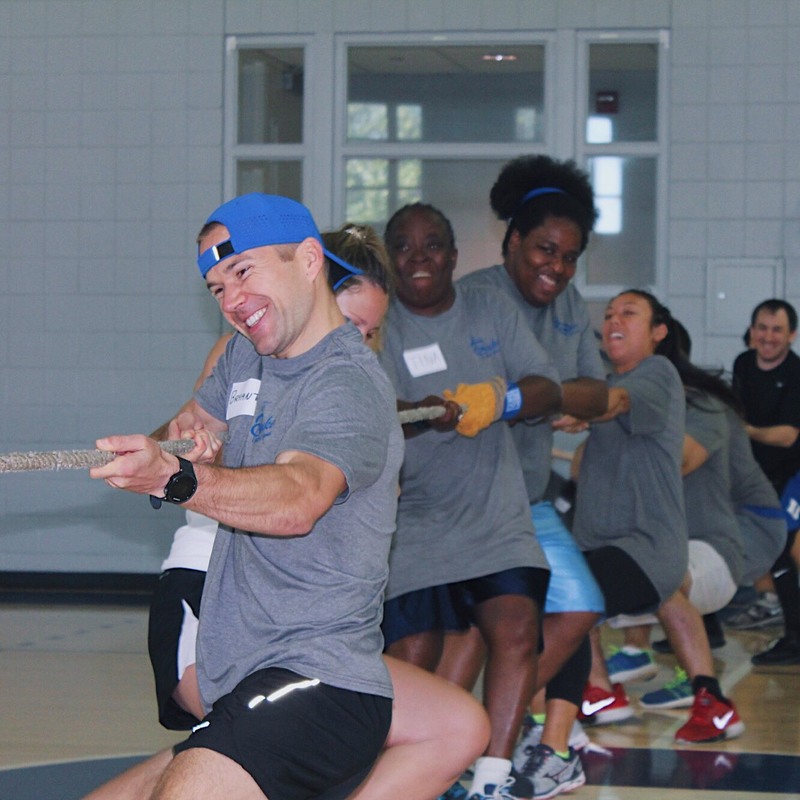 Teams from the College of William and Mary and the universities of North Carolina and South Carolina joined Fuqua students on Duke’s East Campus to play games alongside people with intellectual disabilities from across Durham County. They tugged ropes and shot hoops. They raced in business suits and tossed briefcases. They hugged and high-fived. That kind of interaction is key to Special Olympics North Carolina, which is as focused on bringing the public and people with intellectual disabilities together as it is on fundraising, said Keith Fishburne, the nonprofit’s president. “These are the students who are passing the flame from year to year"
Watching the games unfold on a warm morning in April, Fishburne said this kind of fundraiser tends to die off after a few years as leaders move on and no one picks up the slack. But Fuqua has kept it going for three decades, making it one of the organization’s longest-running events. Beyond keeping the Duke flame burning, Fishburne said he hopes the students involved will stay involved with Special Olympics and spread its message throughout their careers. Denise Wilson said her 30-year-old son Derek, who has epilepsy, looks forward to the games every year. She said he gets a boost from mingling with the students, and suspects they do too. For Bowlen, who plans to return to coaching Special Olympics athletes after graduation, the MBA Games means she has made a personal difference and a wider effect through the money raised.